From Titan Merchandise! The TITANS mini-figures have doubled in size, no doubt due to the use of a polarity reversed Tissue Compression Eliminator the Doctor seized from the Master, for Titan's newest Doctor Who 6 1/2' TITANS! The eleventh Doctor in his darker series 7 costume and the tenth Doctor in his brown trenchcoat are just like their smaller cousins, but twice the size and with sonic screwdriver accessories! 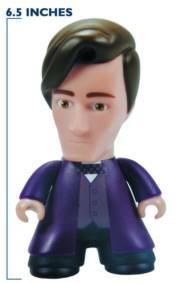 Made of vinyl, these figures will have you shouting 'Allons-y!' and 'Geronimo!' before you know it!